Small objects like electrons and atoms behave according to quantum mechanics, with quantum effects like superposition, entanglement and teleportation. One of the most intriguing questions in modern science is if large objects – like a coffee cup - could also show this behavior. Simon Gröblacher and his team have taken the next step towards observing quantum effects at everyday temperatures in large objects. They created a highly reflective membrane, visible to the naked eye, that can vibrate with hardly any energy loss at room temperature. The membrane is a promising candidate to research quantum mechanics in large objects. The team has reported their results in Physical Review Letters (see link below, or click here for the APS viewpoint article). ”Imagine you’re given a single push on a playground swing. Now imagine this single push allows you to gleefully swing non-stop for nearly a decade. 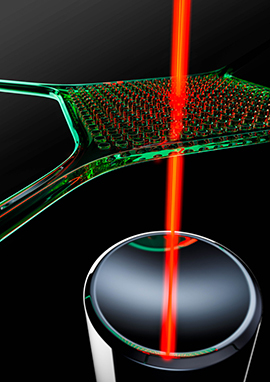 We have created a millimeter-sized version of such a swing on a silicon chip”, says prof. Simon Gröblacher of the Kavli Institute of Nanoscience at the TU Delft. To efficiently monitor the motion of the membranes with a laser they need to be extremely reflective. In such a thin structure, this can only be achieved by creating a meta-material through etching a microscopic pattern into the membrane. “We actually made the thinnest super-mirrors ever created, with a reflectivity exceeding 99%. In fact, these membranes are also the world’s best force sensors at room temperature, as they are sensitive enough to measure the gravitational pull between two people 100 km apart from each other”, Richard Norte says. “The high-reflectivity, in combination with the extreme isolation, allows us to overcome a major hurdle towards observing quantum physics with massive objects, for the first time, at room temperature”, says Gröblacher. Because even a single quantum of vibration is enough to heat up and destroy the fragile quantum nature of large objects (in a process called decoherence), researchers have relied on large cryogenic systems to cool and isolate their quantum devices from the heat present in our everyday environments. Creating massive quantum oscillators which are robust to decoherence at room temperature has remained an elusive feat for physicists. This is extremely interesting from a fundamental theoretical point of view. One of the strangest predictions of quantum mechanics is that things can be in two places at the same time. Such quantum ‘superpositions’ have now been clearly demonstrated for tiny objects such as electrons or atoms, where we now know that quantum theory works very well. But quantum mechanics also tells us that the same rules should also apply for macroscopic objects: a coffee cup can be on the table and in the dishwasher at the same time, or Schrödinger’s cat can be in a quantum superposition of being dead and alive. This is however not something we see in our daily lives: the coffee cup is either clean or dirty and the cat is either dead or alive. Experimentally demonstrating a proverbial cat that is simultaneously dead and alive at ambient temperatures is still an open question in quantum mechanics. The steps taken in this research might allow to eventually observe ‘quantum cats’ on everyday life scales and temperatures. R. A. Norte, J. P. Moura, and S. Gröblacher, Mechanical Resonators for Quantum Optomechanics Experiments at Room Temperature, Phys. Rev. Lett. 116, 147202 (2016). An artist’s impression of the membrane coupled to a laser beam. The periodic pattern makes the device highly reflective, while the thin tethers allow for ultra-low mechanical dissipation.